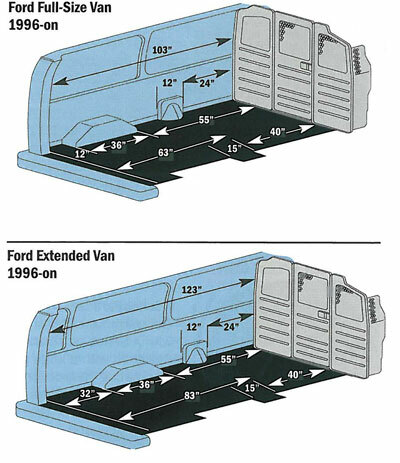 If You are Looking to Organize Your Ford Econoline Van, You Have Come to the Right Place. Not sure what you need in your Ford Econoline? Just start with the Base Plus package featuring ADseries shelving and add the accessories you need, when and where you need them! ­Choose partition style: solid, perforated, or with a hinged door. ­Choose the standard or 3” setback wing kit and add accessories. ­Use layout diagrams to determine the amount of space available. Choose from a variety of shelving units and modules that will best organize the tools and equipment you need to carry. Determine what will be carried: ladders, sheet goods, conduit, etc. Choose from LoadsRite, Grip-Lock, Utility and Cargo racks. Determine the space needed for specialty equipment: tank racks, lockers, reel holders, Stow-Alls and more. Add accessories including door kits, drawer units, hooks and more.